SO4449 3051. The little Herefordshire village of Kilpeck is 2 miles east of the A465 Hereford to Abergavenny road at Wormbridge and 7 miles south-west of Hereford. It is noted for its outstandingly beautiful 12th century Norman church with many carvings that are greatly influenced by the Celtic, Norse and also medieval (Romanesque) periods in history. It is now dedicated to St Mary and St David, its original dedication was to St Pedic or Pedoric, hence the name Kilpeck. This 6th century Celtic saint, a follower of St David or St Dubricius (Dyfrig), had a cell here and later a Saxon church sprang from that in the 7th or 8th century. At the back of the church there is a round-shaped churchyard indicating that this was a sacred site before the coming of the Celtic, Christian church. In 1140-1150 the building that we see now was built over the Saxon building – although as is always the case some restoration has taken place in more recent times. By 1143 the church of Kilpeck was placed under the care of the Benedictine abbey of Gloucester giving it a monastic status; the monks came and built a small cell here soon afterwards. All the carvings that we see here are from the late 12th century and were probably all done by the Hereford school of stonemasons. The church survived being abandoned in the 14th century, the Reformation of the 16th century and the puritans of the 17th century, in fact, the place looks as if it has only just been built, especially as it is always kept well whitewashed and in a most excellent state of repair. Kilpeck church is renowned for its very beautifully carved Norman south door, carved chancel-arch, nave and vaulted apse. Part of the nave (NE corner) may date from the 11th century. The font is Norman but the holy water stoup could be pre-Conquest; this is carved with animal heads and a pair of hands holding two heads. But it is the many carvings on the outside of the church that do it justice for there are so many to see. The exterior of the south door has double columns and a richly carved tympanum over the top. 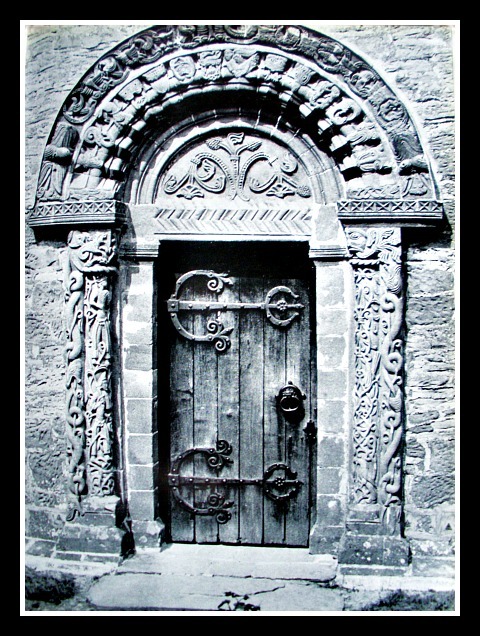 A vast array of carvings can be seen on the doorway including snakes, human heads, foliage, birds, dragons, warriors, medallions and a green man. The tympanum shows what is almost certainly the Tree of Life. 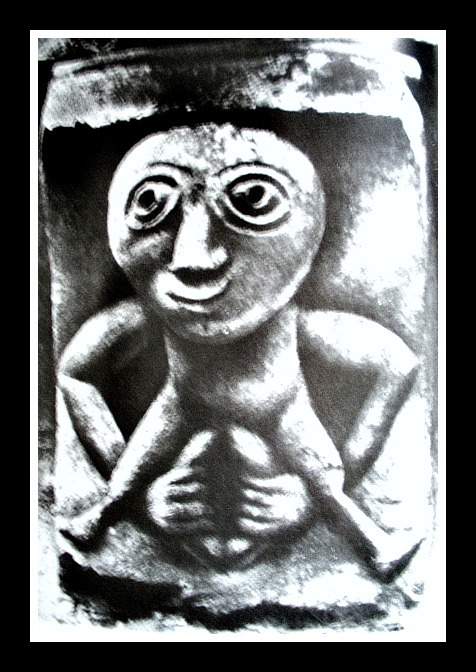 On the exterior walls running along the corbel table below the roof there are many strange, comical and often quite ugly carvings. These include two men fighting, a dog and rabbit, the lamb of God and cross of Jesus, a vulgar sheela-na-gig displaying genitalia, two dragons fighting, green men, a warrior entwined, human heads, a cat and dog and, a pig. But there are others too. A walk around the church is well worth it. Close to the church are the earthworks of a 11th-13th century Norman motte and bailey castle. 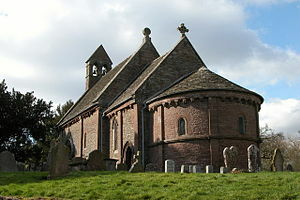 Categories: Ancient Churches & Chapels, Ancient Churches / Chapels | Tags: Kilpeck Church in Herefordshire | Permalink. Don’t know Mr Bieber, sir, your guess is as good as mine. Some blogs may use this, don’t think mine does ? Thanks for your interest in my blog. You are “so” very, very kind. Your lovely comment is much appreciated. Glad I was able to help with my blog. Please come back and browse the sites. Thanks indeed.